Jobs are already coming open around the country, but the craziness is only just beginning. As top programs search for their next head coaches, take a look at 40 candidates you can expect to hear plenty about in the coming weeks. The Chip Kelly Sweepstakes. Grumors. Heavyweight programs from Florida to Tennessee to Texas A&M to Arkansas to Nebraska to UCLA all either are already looking for new coaches or could be soon, and it’s likely more dominoes will fall elsewhere as coaches start making moves. As the coaching carousel heats up heading into Thanksgiving weekend, we’ve put together a shopping catalog of 40 coaches to keep an eye on as schools scramble to fill vacancies. 1. Chip Kelly, former Oregon head coach: The 53-year-old from New Hampshire is the biggest get of the year in college coaching. Kelly isn’t just one of the most innovative minds in offensive football—he also deserves that title on the sports performance front as well. Dozens of college programs have altered their weekly practice schedules in the past few years because of measures he took to get his players primed for game day. Florida officials visited him in his home state last Sunday to make their big pitch, and then some 36 hours later he was meeting with UCLA about possibly resuming his coaching career in the familiar confines of the Pac-12. As we reported on Monday, Kelly, who went 46–7 in his four seasons as a head coach at Oregon, is going to be deliberate in his process. The Gators are hoping for a green light sooner than later. 2. Jimbo Fisher, Florida State head coach: He followed a legend (Bobby Bowden) and has done exceptionally well. Prior to this season, he had seven consecutive Top 25 finishes with four in the Top 10, including the 2013 national title. This fall has been a disaster: The Seminoles are 4–6 and just 3–5 in ACC play. The fan base is frustrated; some say Fisher has been too loyal to his staff and won’t make changes. He has also bristled about the program’s facilities shortcomings. Fisher has had plenty of opportunities to bolt Tallahassee—would he do it now? We’ll see. There have been plenty of rumblings that Texas A&M is prepared to throw a lot of money at him. Would Tennessee or Auburn do the same? 3. Scott Frost, UCF head coach: The former Nebraska quarterback, a Chip Kelly protégé, has led a resurgence at UCF, where the Knights are 10–0 and No. 15 in the playoff rankings. Frost’s team leads the nation in points per game at 48.2. In 2015, the year before he arrived in Orlando, the Knights averaged under 14 points per game (126th in the country) and went 0–12. Frost is likely in play at his alma mater, along with Florida, Tennessee and potentially at Florida State. 4. Dan Mullen, Mississippi State head coach: The Bulldogs are hot, sitting at No. 14 in the playoff rankings, higher than any other three-loss team. The Urban Meyer protégé knows the SEC well and has proven to be an excellent developer of quarterbacks. He has interviewed for several other bigger jobs over the years, but has been unable to land them. This winter is probably his best opportunity. Tennessee, Florida, A&M, Nebraska and Auburn all could be interested in him. He knows he has a good situation. He’s also getting paid well at $4.5 million. Those other programs likely could pay him considerably more, but the pressure would increase significantly, too. He has averaged eight wins a season over the past five years and is beloved in Starkville for that. At one of those other programs, he’d be run out of town for that level of peformance. 5. Gus Malzahn, Auburn head coach: It’s crazy that just a few weeks ago Malzahn was on the hot seat; now he’s two wins away from having the Tigers in the playoff. That’s so Auburn. Malzahn is 44–20 and took the team to the BCS national title game in his first season. In the three years between then and now, the Tigers were two games under .500 in SEC play. The feeling here is he’s always just a two-game losing skid away from being back on the hot seat. He’s from Arkansas and used to be a Razorbacks assistant. Sources have told SI that there’s a lot of support from big money boosters there to bring him back as head coach since Bret Bielema has struggled to build momentum in Fayetteville. If Malzahn wins the SEC this year, it’s hard to imagine Auburn not signing him to a big fat extension, but who knows? We’re talking about him potentially being in the middle of two programs, both of which are in the market for new ADs. 6. Matt Campbell, Iowa State head coach: He’d be higher on this list if his buyout wasn’t so big at over $9 million. Then again, if Tennessee boosters were thinking of breaking the bank for Jon Gruden, why not do it for a younger coach who pulled off two wins over top-five opponents this season while coaching at Iowa State? The Cyclones are 7–4 and spent time in the top 15, remarkable for Campbell’s second year. The 37-year-old Mount Union product is a rising star in the business and is worth chasing for some of these bigger programs. 7. Brent Venables, Clemson defensive coordinator: Venables has made it known he’s not just going to take any head coaching job. The 46-year-old former Kansas State linebacker is very happy with how his life is now as the DC at Clemson, where he’s proven he’s one of the best assistants in the country. He’s also been known as an outstanding recruiter for years. But would he be tempted if Tennessee or Arkansas came calling? Or his alma mater? Another one to keep an eye on is Texas Tech, where Kliff Kingsbury is in some jeopardy. Texas Tech AD Kirby Hocutt is one of Venables’s best friends. 8. Kevin Sumlin, Texas A&M head coach: Sumlin is 51–25 in six seasons at A&M. In 2012, his debut season, he led the Aggies to their first top-five finish in over half a century. Only Alabama, LSU and Georgia have won more games in that stretch in the SEC. The previous six seasons before he took over, Texas A&M was 42–34. However after three consecutive 8–5 seasons, A&M brass and new athletic director Scott Woodward want him out. Sumlin’s a dynamic recruiter who would be a fit in any region. He could be in play at UCLA if Kelly doesn’t end up there—the Bruins once were very interested in him. The former Purdue linebacker also could end up back in the Big Ten at Nebraska. 9. Bret Bielema, Arkansas head coach: Like Sumlin, Bielema came to the SEC with impressive credentials. He won shares of three Big Ten titles. He’s a big charismatic presence. He took over a mess, but has struggled to deliver a breakthrough season with the Razorbacks. His teams are 29–33, and this year has been a dud with the Hogs at 4–7 and just 1–6 in SEC play. The school just canned the guy who hired him, Jeff Long, and it’s very likely Bielema could be next to go with the fat cats wanting Malzahn’s return. Bielema is too good of a coach not to land back in a Power 5 job. There’s been some rumbling that he could return to Kansas State (where he was co-defensive coordinator in 2002–03), possibly as Bill Snyder’s successor. He also might get in the mix for Nebraska. 10. Willie Taggart, Oregon head coach: He recruits very well and develops tough teams, as evidenced by his impressive work at both Western Kentucky and USF. He landed the Oregon job and has things on the right track with a shot at a seven-win season despite missing standout young QB Justin Herbert for half the season. Taggart has a good situation in Eugene, but if either Florida or Florida State came calling it might be pretty hard for the Sunshine State native to say no. 11. Mike Leach, Washington State head coach: The Cougars have a shot at the Pac-12 title this season—amazing when you consider that he took over a program that had won just nine games in the previous four seasons combined. Leach also is the best coach in Texas Tech history. He has a brilliant offensive mind, but calling him a loose cannon would be kind of an understatement. He likes it in Pullman, and his team next year might be even better. But might he be lured away? His old AD Bill Moos now is calling the shots at Nebraska. Tennessee, Arkansas and Ole Miss all might give him some consideration. 12. Dave Clawson, Wake Forest head coach: He had a lackluster season as Tennessee’s offensive coordinator once. So what? He’s won everywhere he’s been a head coach. His Wake team has a chance at winning eight games this season. No small feat. He deserves a look from UCLA or Arkansas or Nebraska. 13. Mike MacIntyre, Colorado head coach: His career 40–58 record is underwhelming, but he did massive overhauls first at San Jose State and then in Boulder, where he led the Buffs to the Pac-12 South title last season. Colorado is hoping to get bowl eligible this week. Word is the former Ole Miss assistant is high on the Rebels’ radar as they look to do their own big rebuild in the wake of NCAA sanctions. 14. David Cutcliffe, Duke head coach: At 63, the Vols’ former offensive coordinator has a revered place in Tennessee history. He has also done a terrific job at Duke. Would his old boss Phil Fulmer, now in an advisory role in Knoxville, have enough sway to get Cutcliffe back? His age doesn’t help his cause, nor does the Blue Devils’ 3–12 mark in the ACC the past two years. Perhaps if he could bring his protégé-turned-USC offensive coordinator Tee Martin back with him, it might be more plausible. 15. Jeff Brohm, Purdue head coach: He’s one more win away from getting the Boilermakers into a bowl game. Not bad for a debut season. Brohm is one of the most creative offensive minds in football. He’s made Purdue football fun again. That’s no small feat. The feeling here is that he could be a good fit for Tennessee or Arkansas, but will those schools think he’s done enough to warrant the job? 16. Kyle Whittingham, Utah head coach: One of the 15 best coaches in football. His teams are always physical. The Utes won 28 games the previous three seasons but lost a ton of talent to the NFL and are struggling to get bowl eligible. Both UCLA and Tennessee could do a lot worse, and have done a lot worse in their previous coaching searches. Would he leave Salt Lake City? It’s at least worth asking. 17. Greg Schiano, Ohio State defensive coordinator: He did an amazing job turning a dismal Rutgers program into a respectable one before he left to take over the Tampa Bay Buccaneers. Schiano returned to the college game last year and has become Urban Meyer’s right-hand man. He also had an exemplary academic track record with his program at Rutgers—at one point the Scarlet Knights ranked behind only Northwestern in APR among FBS schools and had the best mark of any state university in the nation four years in a row. Years ago Schiano turned down the Michigan job. He interviewed for the USC head coach vacancy a few years ago. I’m told there is a real possibility he could get the Tennessee job. Arkansas and UCLA are two other places where he could be in consideration. 18. Gary Kubiak, former NFL head coach: His résumé is actually pretty similar to Jon Gruden’s, minus the big TV gig and flashy persona. The 56-year-old has led a team to a Super Bowl and has a winning record after a decade of coaching in the NFL. He also has a bit of college coaching experience from about 25 years ago. The Houston native who works in the Broncos’ front office was a record-setting QB at Texas A&M and would have some support from the Aggie family if they can’t get Jimbo Fisher. 19. 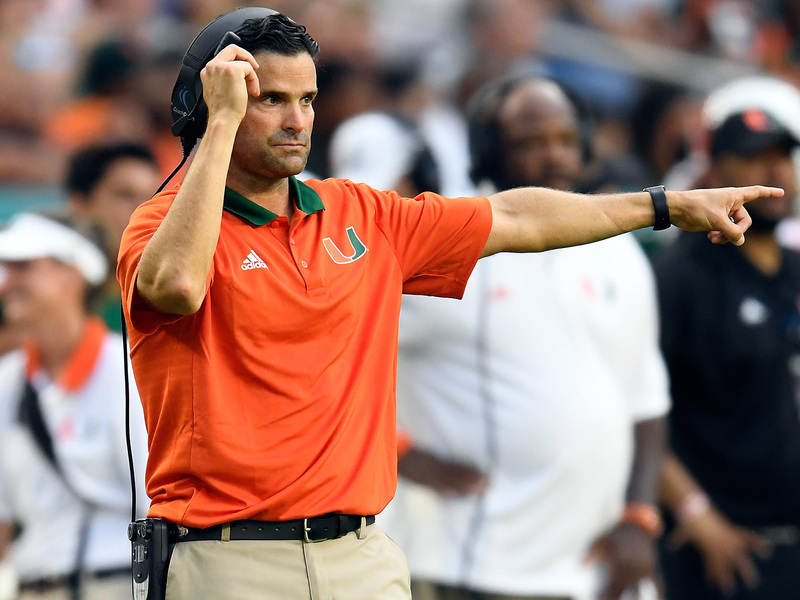 Manny Diaz, Miami defensive coordinator: The brains behind the famed Turnover Chain and Hurricanes’ aggressive defense, Diaz has a good shot to win the Broyles Award, honoring the nation’s top assistant. The Miami native would seem like a no-brainer for Mississippi State if Dan Mullen does leave for another job. Diaz twice worked in Starkville and did impressive work there. 20. Jedd Fisch, UCLA offensive coordinator: He has worked under Pete Carroll, Mike Shanahan, Steve Spurrier and Jim Harbaugh and has done a really good job pumping life back into the UCLA offense this season despite being the Bruins’ third OC in three years. The Bruins have jumped 70 spots from last year to No. 21 in total offense despite losing two of their best receivers. Fisch is very well-regarded inside of UCLA. USC has gone the promoting-the-interim route across town with considerable success. Fisch has less of a window to prove himself as a head coach than Clay Helton did, but he could impress more folks there with this opportunity. 21. Alex Grinch, Washington State defensive coordinator: This is by far the best defense Mike Leach has had in almost two decades as a head coach. Luring Grinch off the Missouri staff might be the shrewdest move Leach has ever made. Washington State ranks No. 11 in the nation in total defense—that’s about 100 spots higher than where they resided before Grinch came to Pullman. He’s very respected as a playcaller around the Pac-12. He’s another guy with Mount Union roots and is a very hot commodity now. Bigger Power 5 programs will try and hire him as their defensive coordinator, but Oregon State might look to him for their head coach job, and the Cougars could too if Leach were to leave. 22. Jeremy Pruitt, Alabama defensive coordinator: Being a coordinator under Nick Saban often leads to an SEC head coaching job, and the 43-year-old Pruitt is the next in line. In 2013, he helped Florida State win a national title. He returned to the Tide and again has Bama’s defense ranked No. 1 in the country. Would Tennessee or Arkansas or Auburn give him the keys as a first-time head coach? The example of Kirby Smart at Georgia is playing well right now for Pruitt. 23. Ken Niumatalolo, Navy head coach: Few coaches are respected more by their peers than the guy who has spent a decade piling up wins at Navy. Niumatalolo is 52 and was in the mix for the Cal job last year. His option scheme isn’t for everyone, but it might play well at Nebraska or Oregon State, where his recruiting ties could be a big asset getting things going in Corvallis. 24. Frank Wilson, UTSA head coach: The charismatic New Orleans native, who was a top recruiter at LSU for Les Miles, led the Roadrunners to their first bowl in his debut season. One SEC administrator pointed out to me before this season that the fact that he’s proven he can recruit well in the SEC separates him from a lot of the other names people are putting on lists. Both Ole Miss and Mississippi State could be options for him too. Maybe Arkansas as well. 25. Craig Bohl, Wyoming head coach: His age might scare a lot of ADs. He’s 59 but he has done a fantastic job at Wyoming after leading North Dakota State to three national titles. If Bill Snyder decides to step down, Bohl could be in play at Kansas State—his old AD is now in Manhattan. He also has strong Nebraska ties, and he thrived off the old Husker model at both of his last two coaching stops. 26. 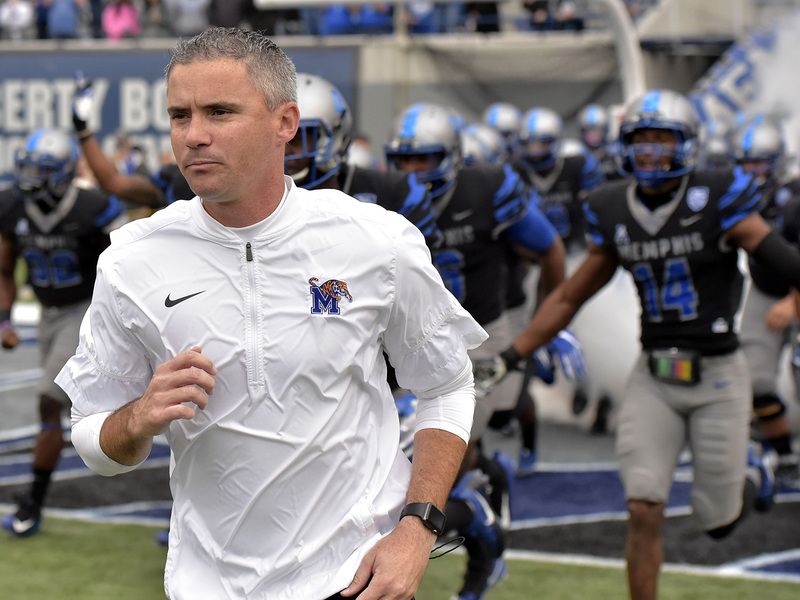 Mike Norvell, Memphis head coach: He’s done a nice job building off what Justin Fuente got going with the Tigers. Norvell is a rising star, and he’s only 36. The odds are in his favor in that there are so many vacancies. He may get a look from Tennessee, Arkansas or UCLA. 27. Bryan Harsin, Boise State head coach: A Chris Petersen protégé and a former assistant at Texas under Mack Brown, Harsin is 40–11 in four seasons at Boise State. He coached at Arkansas State for one season. Would Arkansas want him? He might also get a look from UCLA if Kelly doesn’t take the Bruins vacancy. 28. Charlie Strong, USF head coach: Another former Urban Meyer assistant, Strong fizzled at Texas after three tumultuous seasons, but he has had a good first year at USF. He knows the SEC very well and has a great reputation with his players. Ole Miss has some interest. He’s also an Arkansas native, but we’re not sure if the Hogs would go after him after his tenure at Texas. 29. Neal Brown, Troy head coach: His stock rocketed up after the Trojans knocked off LSU in Baton Rouge this year. In truth, the 37-year-old former Kentucky offensive coordinator already was on Ole Miss’s radar. His teams are 18–5 the past two seasons. We could see him at either of the Mississippi schools next year. 30. Tee Martin, USC offensive coordinator: The 39-year-old former NFL QB who led Tennessee to a national title two decades ago has played a key role in the Trojans’ return to the top 10. Martin has long been regarded as one of the better recruiters in college football and has developed a bunch of playmakers both in his time at Kentucky and USC. His affable personality plays well everywhere. He’s also a Broyles Award semifinalist, which doesn’t hurt his stock. Would his alma mater think he’s ready for the big job in Knoxville? 31. Troy Calhoun, Air Force head coach: He won 28 games at the academy the previous three seasons. This year, the Falcons have struggled, but the 51-year-old former NFL OC, an Oregon native, might be a good option for Oregon State or at an Ole Miss program looking for someone to pull them out of a nasty scandal. 32. Beau Baldwin, Cal offensive coordinator: His 95–35 record as an FCS head coach is impressive, as is his work this season helping Justin Wilcox get Cal rolling. Oregon State has some interest. Would UCLA give him a look as well? 33. Jeff Monken, Army head coach: Earlier this season he got a new five-year deal. He deserves it. He’s been superb leading Army to 16 wins the past two seasons. They’d won just eight games in the three years before he’d arrived. He has Midwest roots—would Nebraska think he’s right right guy? 34. Jason Candle, Toledo head coach: Another Mount Union guy, Candle is impressive in-person. He’s piling up wins in the MAC with a shot at 10–2 after winning nine in his first season. If it were the Big Ten having the run of numerous coaching vacancies this year instead of the SEC, I think he’d get scooped up, but maybe not this time, although he’s a name to remember as other dominoes start to fall. 35. Seth Littrell, North Texas head coach: A Mike Leach disciple, the former Oklahoma fullback has made good strides in his first two seasons as a head man, going from five wins to eight with a shot at the C-USA title. He has Texas Tech ties and could be in consideration if the Red Raiders move on from Kliff Kingsbury. 36. Mike Bobo, Colorado State head coach: The former Georgia QB and offensive coordinator has won 21 games in three seasons with the Rams. He has strong SEC roots and would probably jump at the chance to come back. He’s another one who is likely to get some interest from Ole Miss and Mississippi State. 37. Blake Anderson, Arkansas State head coach: The 48-year-old Larry Fedora disciple is 30–18 in four seasons at Arkansas State, which has a Top 20 offense this season. He is well-regarded around the state and should get some consideration at Arkansas if the Hogs are in the market. 38. Chad Morris, SMU head coach: The former Texas high school coach did a great job helping Dabo Swinney get Clemson rolling, then took over an SMU program that had fallen apart and went from two wins to five wins to a shot at seven wins this year. Has he shown enough to have a realistic shot to get hired at his alma mater Texas A&M as the head guy? It’s a stretch to think the Aggies would—given he’s 7–16 in the AAC—but he could be in consideration at the Mississippi schools and perhaps Texas Tech, where he came in second to Kingsbury the last time it was open. 39. Scott Satterfield, Appalachian State head coach: Satterfield’s teams are 19–3 in the Sun Belt the last three seasons, and he’s considered one of the top Group of Five coaches in the country. The 44-year-old North Carolina native may be in consideration for a few of these potential SEC vacancies—perhaps Ole Miss or Mississippi State (if Mullen leaves) would be good fits. 40. 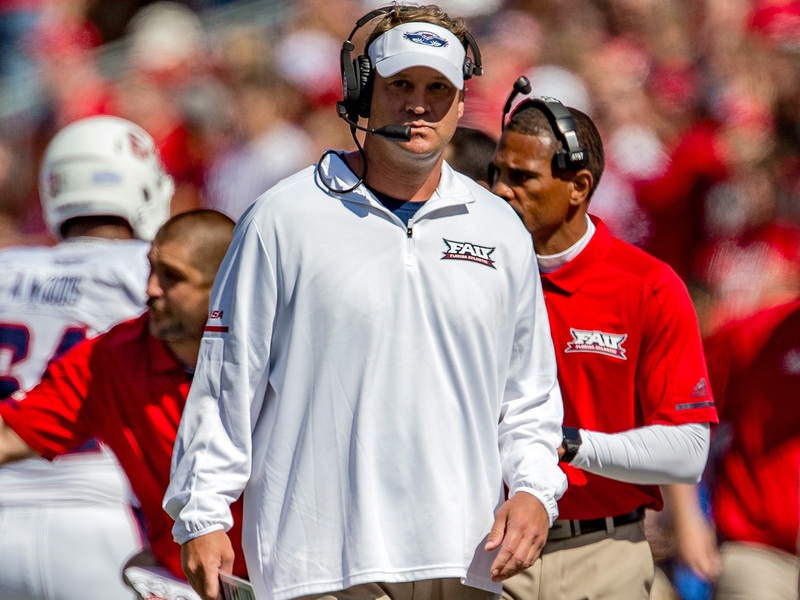 Lane Kiffin, Florida Atlantic head coach: He has done better in Year One than just about anyone could’ve expected—Lord knows he’s made FAU nationally relevant. But the question remains from a year ago: Would any Power 5 AD and president trust him to be the face of their program? The feeling here is not at this point.